##[error]Unable to find version '5.1.1' of package 'AutoMapper'. 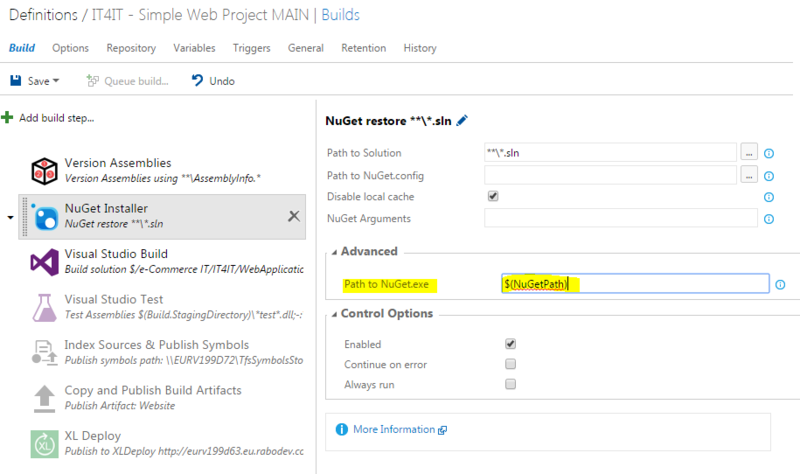 Without digging into details of why this is happening, I’ll show you how to push your build to use a different version of a nuget client. As a first thing, let’s “install” the latest nuget version on our build server. Just download the latest version of nuget client and place it in a folder of your choice. Make sure that account on which your build agent is running has sufficient rights to access that path. For me it will be ‘D:\Program Files(x86)\Nuget‘. If you can see it listed correctly, it all went well till now. Now it’s the time for the build. I suppose you are using the NuGet Installer build step in order to restore your packages before the build. If not, you should, as resorting the packages from Visual Studio Build step is obsolete and should not be used. That’s all folks, an easy way to push you build to use a specific version of the NuGet client instead of the default one. The issue with this is when the agent updates (and it will do so automatically with any TFS update) your changes will be removed. This is not the way you would want to deal with this issue. It’s complicating the creation of new build servers, as it needs a custom NuGet.exe and custom capabilities and it requires all of your builds (which the teams manage for themselves) to depend on these settings. As Mario states, Leon’s solution doesn’t work either because the agents might get ‘updated’ from TFS and NuGet.exe will be brought back to it’s original version. There should (must) be a way to update NuGet.exe in the actual NuGetInstaller build step itself. Another thought is that NuGetInstaller uses a node_modules path locally on the build server. I have not yet analysed it all the way, but if the NuGetInstaller step is able to use NPM to download the latest version of NuGet, that would also do the trick. it may not be a perfect way, but it is a solution (brought up in 1-2h time in order to quickly solve a problem). I would be happy to improve in case you do come up with a better one. 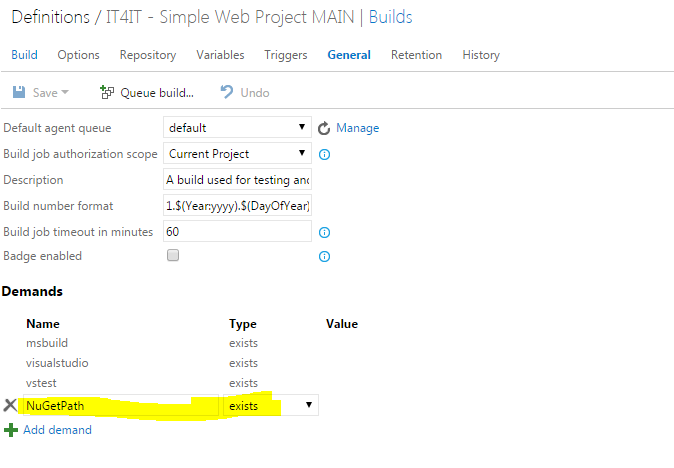 It helped me to solve perfectly a NuGet issue I had on my TFS server.